Estates are factions within the nation that influence domestic politics. Estates apply modifiers at the national level and may also be granted control of specific provinces. They have two basic attributes: influence and loyalty; which depend on the land they hold, event choices and several other factors. The influence and loyalty levels of an estate determine their power within the country and how they "react" to the player's actions with them. These can be seen in the: nationwide bonuses or penalties provided by the estate, localized effects which are applied in the provinces held by them, outcome effects of certain interactions provided through the estates, as well as their rebellion strength if worse comes to worst. Estates which grow too powerful can bring a disaster upon the nation. This may come into effect by an estate seizing control of the country or breaking it apart. There are a total of 11 estates though most nations have access to 3 estates. The exact number may change during the campaign and depends on location, government and religion. Conquered provinces have their estates removed. It is possible to add more estates to the game and change conquest behavior via modding. The following government types do not have access to estates (they have other mechanics instead): Celestial Empire (if Mandate of Heaven is disabled), Merchant Republic, Veche Republic, Pirate Republic, Trading City, Colonial Nation, Native Council, Siberian Clan Council and Steppe Nomads (except Tribes estate). Certain government types don't have access to specific estates (detailed in the estate's section). Note: Most of the values mentioned here are fully moddable. Loyalty is a measure of how willing the estate is to aid in the nation's government. It is a modifier that decays slowly towards its base value of 50. The speed of decay depends on how further from 50 it is (further = faster) and on any other loyalty decay speed modifiers present at the time. Loyalty scales from 0 to 100, and is separated into three tiers: disloyal (0−39), neutral (40−59), and loyal (60−100). Loyalty determines what effects the estate confers, both on the provincial and national level. When disloyal, an estate confers only penalties; when neutral, it confers a single bonus; and when loyal it confers an additional bonus. The strength of the effects is determined by the estate's influence. Loyalty is affected by estate interactions, various national factors, events, decisions, provincial development and territorial grants and revocations. (Estate) influence is a measure of how much power the estate has over the nation's government and scales from 0 to 100. Influence determines the strength of the national effects conferred by the estate's loyalty through four levels: 0−19 / 20−39 / 40−59 / 60−100. These levels modify the effects by a factor of 0.25 / 0.50 / 0.75 / 1. The provincial effects are not affected by influence and are applied in all provinces owned by the estate. Moreover, if an estate's influence is 100, regardless of the estate's loyalty, the nation is at risk of the estate seizing power in a coup, in the form of a disaster. Influence affects also the strength as well as the possibility of some estate interactions. Each estate has a base level of influence, and is affected by estate interactions, various national factors, events, decisions, and territorial grants and revocations. Influence does not increase or decrease over time. Revoking province is the only player-controlled way to decrease influence. If an estate's influence drops to 0, it will grant no nationwide effects but will still appear in the Estates interface and still affect controlled provinces. Territory can be granted to an estate to increase its loyalty and influence. A province can be granted or revoked in the Buildings tab of that province. Granting a province to an estate sets a minimum local autonomy floor to the province and confers various provincial effects based on the estate and its level of loyalty. Once granted to an estate, a province cannot be revoked until one year has passed. If an estate is disloyal, revoking a province from the estate will cause rebels to rise up. Developing an estate province is treated as if they were granted additional development; losing an estate province (peace, sale etc.) will cause their loyalty to decrease (amount dependent on province development). Revoking an estate from a province will add 25% local autonomy and a temporary +5 unrest modifier unless the province is granted to another estate. The capital cannot be granted to an estate and a province cannot have both an estate and a parliament seat. Power (calculation) is based on how much an estate controls the development in the country. Influence of an estate increases by 1.5 for every 1% of the nation's total state development it manages, up to a maximum of 40. The dhimmi and tribes estates have modifiers that lower this factor. Hence all provinces granting/revoking above 26.7% of the total development does not impact the influence. For example, in a nation with 200 non overseas development, granting a first province with 10 development to an estate will increase its influence by 7.5. If another estate controls provinces that represent 60 development in that country (30%) its influence is increased by 40 and revoking a 3-development province has no impact. Happiness (calculation) is based on territorial grant/revocation. Territorial grant (resp. revocation) increases (resp. decreases) the estate's loyalty by a base of 1 (resp. 2) for every 1% of the nation's total development that the province represents. This means that granting and subsequently revoking a province incurs a net loss of loyalty. The gain is capped to 20 and the loss to 30. Interactions are a set of actions that can be taken towards estates, typically either giving something to the estate or requesting something from it. Interactions affect the estates' loyalty and influence in various ways. (Estate) Disasters occur after an estate gains high influence levels (100). The estate disaster will begin ticking and - unless lowered - will eventually trigger its associated disaster. During an active estate disaster all other estates will lose influence and loyalty as well as rendering most of their estate interactions inactive. This estate represents the urban population of your country such as Artisans, Merchants or others that reside inside city walls. Their traditional responsibility is to work to keep the economy going and in order to do so efficiently they expect to be granted special rights and privileges for themselves and the cities they represent. The estate is not available for nations with the Vaishyas or Jain estates. The AI will be more inclined to give the estate territory if it is a Monarchy in the Western tech group or has taken Plutocratic or Trade idea groups and the nation has at least 10 provinces. +5% Has its capital in one of the Swahili Coast areas: Central Swahili Coast, Northern Swahili Coast, Mogadishu, Mombasa and Mozambique. Rebels: If a province is revoked from the Burghers while they are disloyal, Particularist rebels will rise in revolt in that province. Disaster: If the Burghers estate reaches 100 influence, their estate disaster will begin ticking and - unless lowered - will eventually trigger the Plutocratic Coup disaster. This estate represents the educated priests of your state religion. They have a long tradition of serving in the administration of your country and their traditional responsibility is to care for the spiritual well-being of it and your people. Over the centuries they have acquired both land properties and privileges from former rulers as well as pious individuals. The Clergy estate is not available for the United States unless the government is a theocracy. It is not compatible with the Brahmins estate for nations with sikh or hindu religion. The AI will be more inclined to give the estate further territory (than the required minimum) if it has taken Religious idea group and the nation has at least 10 provinces. Rebels: If a province is revoked from the Clergy while they are disloyal, Zealot rebels of the state religion will rise in revolt in that province. Disaster: If the Clergy estate reaches 100 influence, their estate disaster will begin ticking and - unless lowered - will eventually trigger the Dominance of the Clergy disaster. This estate represents the families of landed aristocrats in your country. Their privileges are guaranteed by old traditions and most have originally been won through performing great services to the state. Their traditional responsibility is to fight and protect the realm against outside dangers as well as help the ruler keep the peace. Parliamentary and Revolutionary government types along with Peasant Republics do not use this estate. Additionaly, only muslim, sikh, and Buddhist nations may combine this estate with the Marathas or Rajputs estates. The AI will be more inclined to give the estate provinces if it has taken Aristocratic or Influence idea groups and the nation has at least 10 provinces. Rebels: If a province is revoked from the Nobility while they are disloyal, Noble rebels will rise in revolt in that province. Disaster: If the Nobility estate reaches 100 influence, their estate disaster will begin ticking and - unless lowered - will eventually trigger the Aristocratic Coup disaster. Any change in Loyalty or influence apply to the estate which provided the interaction. Estate Influence and modifiers gained from interactions will remain active for said interaction's cooldown period. Most of the interactions provided by an estate become unavailable during other estates' ongoing disaster. This condensed table shows all influence and loyalty breakpoints and bonuses. Loyal estates also get the Neutral bonus. The Cossacks are the free people of the Steppes. Their background varies, some have been born on the grasslands while others are escaped serfs from the great latifundia that border the wild fields. Great raiders and hardy settlers, the Cossacks aspire to be recognized as an estate of the same importance as the Nobility and to strike down at anyone who would attempt to limit their freedom. This estate is only available to Christian nations in the Eastern tech group. The Cossacks receive twice the normal influence from provinces ( 3 influence per 1% of total development). The AI will always grant provinces to the estate as long as it doesn't push its influence too high. If the estate revolts it will form a new nation consisting of the provinces previously given to it. Rebels: If a province is revoked from the Cossacks while they are disloyal, Cossack rebels will rise in revolt in that province. 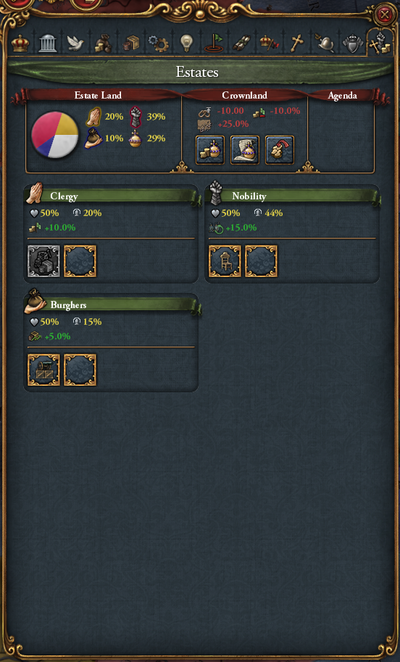 Disaster: If the Cossacks estate reaches 100 influence, their estate disaster will begin ticking and - unless lowered - will eventually trigger the Cossack Independence disaster. Originally a term reserved for Christians and Jews the Dhimmi are the non-Muslim subjects in a Muslim realm. Their status and privileges can vary greatly between different states as do both their organization and numbers. Traditionally it is the responsibility of a just ruler to protect these people while keeping them apart from the Muslim majority. These principles are not always as easy to keep in parts of the world where the Dhimmi may constitute the majority of the population themselves however. The Dhimmi estate is only available to Muslim nations that are not in the Western tech group. The Dhimmi receive only half the normal influence from provinces ( 0.75 influence per 1% of total development). If the estate revolts it will form a new nation consisting of the provinces previously given to it. The AI will always grant provinces to the estate if it is in the Anatolian tech group or has taken the Humanist ideas group and the nation has at least 10 provinces; The AI will continue doing so as long as it doesn't push its influence too high. Dhimmi provinces cannot be converted to another religion by a missionary. Rebels: If a province is revoked from the Dhimmi while they are disloyal, Zealot rebels of the province's religion will rise in revolt in that province. Disaster: If the Dhimmi estate reaches 100 influence, their estate disaster will begin ticking and - unless lowered - will eventually trigger the Dhimmi Independence disaster. The ruler of a nomad realm must always strive to keep control over the many tribes that make up his lands. As there are no strong or permanent institutions in the same way as in many sedentary states the tribes are the primary source of authority and acts as everything from tax collectors to soldiers or raiders. While the Tribes consider the ruler of their state the foremost of them they expect to be given large land areas to feed their horses and support their lifestyles as well as to be granted influence over most of the day-to-day matters of the state. The Tribes estate is only available to Steppe Nomads and is the only estate available for them. The Tribes only receive 40% of the normal influence from provinces ( 0.6 influence per 1% of total development). Rebels: If a province is revoked from the Tribes while they are disloyal, Tribal rebels will rise in revolt in that province. Disaster: If the Tribes estate reaches 100 influence, their estate disaster will begin ticking and - unless lowered - will eventually trigger the Dominance of the Tribes disaster. The Brahmins are the priestly caste of Hinduism. They are the keepers of ceremonies and scriptures, as few non-Brahmins are educated in Sanskrit literature. They command great respect from Hindus and non-Hindus alike, and sometimes take roles in government. The Brahmin estate replaces the Clergy estate for Hindu nations, and the Dhimmi estate for Muslim nations with the Indian tech group. The AI will grant more provinces that usual if it is a Hindu nation that has embraced Religious ideas, or a non-Hindu nation that has embraced Humanist Ideas. Rebels: If a province is revoked from the Dhimmi while they are disloyal, Hindu Zealot rebels will rise in revolt in that province. Disaster: If the Brahmins estate reaches 100 influence, their estate disaster will begin ticking and - unless lowered - will eventually trigger the Dominance of the Brahmins disaster. Jainism is no longer a dominant or politically favored faith in India, but the Jains are far from irrelevant. They have found a niche in moneylending and bureaucracy that makes them an asset to any state that offers them patronage. The Jain estate is available to all nations within the Indian tech group. While Hindu nations get Jains in addition to the Vaishyas estate, for non-Hindu nations it replaces the Burghers estate. The AI will keep granting provinces to Jains as long as it doesn't raise their influence too high. Rebels: If a province is revoked from the Jains while they are disloyal, Particularist rebels will rise in revolt in that province. Disaster: If the Jains estate reaches 100 influence, their estate disaster will begin ticking and - unless lowered - will eventually trigger the Powerful Jain Society disaster. While originally a term applied to all Marathi-speaking peoples, the Marathas have defined themselves as a caste of warriors. The Marathas are found both in their native home of Maharashtra and beyond, seeking opportunities for distinguished military service. The Marathas estate is available to any nation of the technology group whose primary culture is Sinhala or belongs in the Western Aryan or Dravidian culture groups "except" for Rajasthani or Malvi. For nations that are not Muslim, Sikh, Theravada, Vajrayana or Mahayana, this estate replaces the Nobles Estate. The AI will give this estate provinces as long as it doesn't raise influence too high. Local autonomy is negated for Local Manpower modifier and Land Force Limit modifier. Rebels: If a province is revoked from the Marathas while they are disloyal, Noble rebels will rise in revolt in that province. Disaster: If the Marathas estate reaches 100 influence, their estate disaster will begin ticking and - unless lowered - will eventually trigger the Maratha Independence disaster. The Rajputs are an ancient caste of honorable warriors and proud nobles. While the rugged land of Rajasthan is the heart of their power, Rajput nobility can be found throughout northern India and many great Rajas claim Rajput descent. The Rajputs estate is available to any nation with the Indian technology Group and their primary culture is Rajput or Malvi, or belongs to the Eastern Aryan (except Sinhala), Hindustani or Central Indic culture groups. For nations that are not Muslim, Sikh, Theravada, Vajrayana or Mahayana, this estate replaces the Nobles Estate. The AI will give this estate provinces as long as it doesn't raise influence too high. Rebels: If a province is revoked from the Rajiputs while they are disloyal, Noble rebels will rise in revolt in that province. Disaster: If the Rajputs estate reaches 100 influence, their estate disaster will begin ticking and - unless lowered - will eventually trigger the Rajput Independence disaster. In Vedic scripture, the Vaishya caste are laborers and agriculturalists of relatively low status. They have since branched out into more lucrative professions; merchants, craftsmen, men of money, they are the lifeblood of Indian commerce. The Vaishyas estate is available to Hindu nations in the Indian tech group. It replaces the Burghers estate. The AI will give the Vaishya more provinces than normal if it has embraced the Trade or Plutocracy idea groups. Rebels: If a province is revoked from the Vaishyas while they are disloyal, Particularist rebels will rise in revolt in that province. Disaster: If the Vaishyas estate reaches 100 influence, their estate disaster will begin ticking and - unless lowered - will eventually trigger the Vaishya Guild Coup disaster. Improve the appropriate development type of an estate province due to the malus from minimum local autonomy. Prioritize the buildings that take advantage of the exception to local autonomy. e.g. marketplace in a burgher province. When demanding support from an estate attempt to get influence above 50, but be wary of getting above 75 as an unexpected event could launch an estate disaster. Estates have more interactions that lower loyalty than ones that raise it. Prioritize interactions to vital needs first, taking secondary interactions only if the malus from low loyalty is affordable. e.g. Burghers loyalty at 50, Grant Monopoly Charter raises it to 65, Demand Diplomatic Support lowers it to 45. Are the 5 heavy ships from Draft Ships for War important enough to justify lowering loyalty to 30 and suffering between -2.5% and -10% to both trade efficiency and development cost (depending on influence), along with -5 unrest in Burgher provinces? Always know when estates will be able to provide more support. If an estate disaster does begin countdown, check to see if any temporary modifiers on their influence from events or interactions will expire soon, dropping their influence back below 100, before revoking provinces. ↑ 1.0 1.1 1.2 1.3 All individual estate files can be found in the /Europa Universalis IV/common/estates/ folder.